Our volunteers serve in multiple roles in our schools — many service as mentors, while others serve as tutors, Partners in Education or parent volunteers. Prime Time volunteers, those 55 years or better, are Reading Buddies Mentor and classroom helpers. We value the dedication, energy, compassion and time of each volunteer, as they work to enhance the educational experience of our youth. 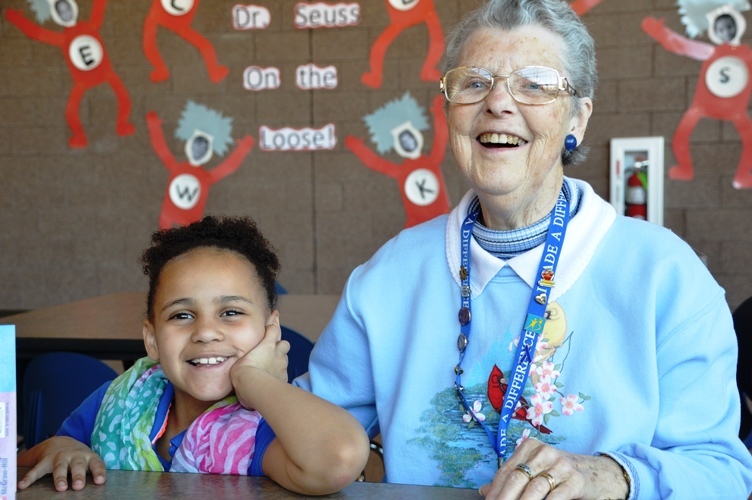 Click here to see a great video about Reading Buddies! As you know times have changed – making it more challenging for school districts to provide a safe environment for our students. The reality today is more and more places that allow volunteers to work with children are doing background checks or other screenings to ensure the safety of the children AND the adult volunteers. In many local churches, for example, it is commonplace for a background check and reference checks to take place before someone can volunteer in Sunday School. Similarly, Waterloo Schools wants to do what’s best for kids and implement a more thorough vetting process for its volunteers. It is certainly not required, but donations will be accepted if you would consider paying a small fee to cover your own background check (cost is $12.00). Please make any donation check out to Waterloo Schools. (BBBS) works cooperatively with the district by providing adult mentors to children. BBBS recruit, screen, train, and support the mentors. Adult mentors, along with parents/guardians, provide young people with support, counsel, friendship, reinforcement and a constructive example. For more information contact, Big Brothers Big Sisters of Northeast Iowa at 319-235-9397. Your BBBS match can be either school based or community based. Other Volunteer Opportunities… Are you looking to volunteer your time or talents with the students, faculty, and staff of the Waterloo Community School District? For more information call 319-235-2553. Thank you for your interest in volunteering with the district. To become a volunteer you must submit a Volunteer Application. Application Procedure: Complete the application form. Some positions may require additional documents as is noted. Application Process: 1. This process is a review of application and references. 2. Discussion Applicants will be contacted by the appropriate staff person to discuss level of interest and address any questions you may have. 3. Placement After any necessary paperwork, interviews or screenings you will receive confirmation of your placement and necessary materials (ie: maps). 4. Orientation Expect to set up a date and time to become oriented to the building you will be volunteering in or program you will be volunteering for. Thank you for your interest. Each completed application will remain on file. For more information, please contact School & Communication Relations at (319) 433-1826. Reading buddy working with student.